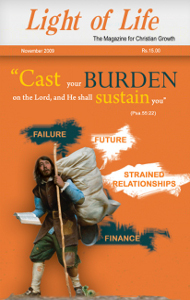 DON'T QUIT - God will communicate with us when we move towards him, asserts Leonard Cutler. OF CRIMES & SINS - II - Kuruvilla Chandy emphasises: Immoral acts that violate divine law are sins. GOD SMILES ON US - A call by Koshy Mathew to rejoice in the Lord. ROLE MODEL FOR LAWYERS AND LEADERS - M. P. K. Kutty reminds: It is the fate of every generation to defend democracy. DID JESUS WEAR DESIGNER ROBES? - J. Kwabena Asamoah-Gyadu explains: Gospel of Jesus Christ glorifies neither poverty nor prosperity. 3 DAYS AND 3 NIGHTS - A possible explanation by C. O. Jacob for the time of Christ's Crucifixion, Burial and Resurrection. THE GOSPEL: ANTI-DOTE FOR HATE - J. N. Manokaran explains the need to proclaim the Gospel even in adverse circumstances. A TEARFUL MOMENT - Jesus can cure the broken heart and the grieving spirit, emphasises Peter S. C. Pothan. THE CASE OF A TYPICAL METRO-CITY TEEN - Geo Verghese reiterates: Control is elementary for nature, society and individuals. NOTES ALONG THE JOURNEY - XIV - Oby Cherian talks about keeping pace.